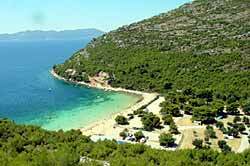 Prapratno is a small bay situated just about 3 kilometres west of ancient town Ston on Peljesac peninsula. The bay is south facing and it has its sandy beach that is considered as one of the most beautiful beaches in the whole Adriatic. Seawater is warm and crystal clear while the bay is surrounded by olive and pine trees. Near the beach there is a camp-site too that attracts hundreds of tourists and travellers in summer months. Right above the bay, there is a small cafe – bar/restaurant where most of the buses that travel along Peninsula stop for break and refreshment. From that point, there is about 15 min walk downhill to reach the ferry terminal. 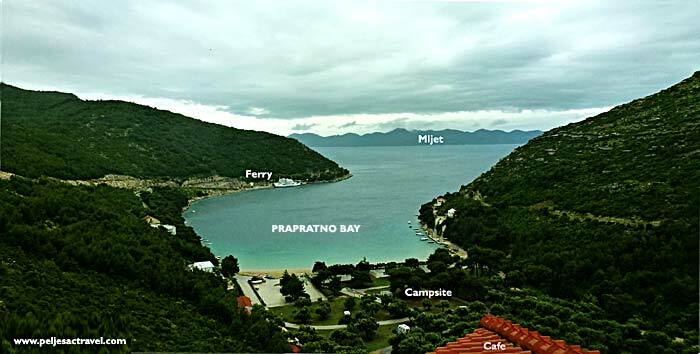 Recently the bay become important as a connection point for a ferry from Prapratno to Mljet (Sobra), a new ferry pier was ready in 2006 and is currently fully functional. Bus from Prapratno to Dubrovnik Airport – newly introduced service ideal for travel to Mljet National Park. Note, you can be picked up by this bus if you get in touch with bus company even in Dubrovnik port in case you arrive or depart from there to Bari in Italy and would like to travel to Mljet. Prapratno bay viewed from the small restaurant above the bay on the rainy, winter day.